Created VFD for mobile ventilation unit which automatically increases motor speed to maintain CFM regardless of filter back pressure and altitude. A major supplier of ventilation/pressurization units for various tent-based systems (i.e. 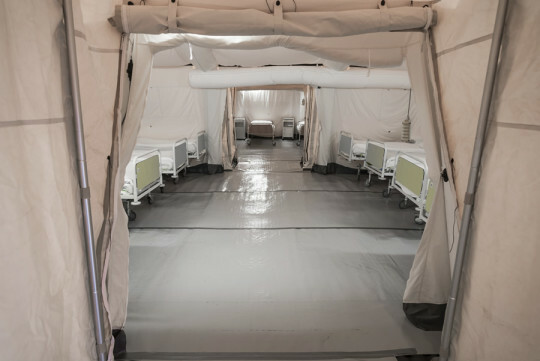 medical aid, mobile hospital, troop quarters, etc) was experiencing excess premature filter replacement demands caused by filtered particle build up. The ventilation units are required to deliver a constant airflow and as the back pressure increased, the only in-field solution was to replace the filter. Invention House solved this problem by creating a custom drive solution which had 50% more horsepower and could maintain the airflow against higher filter back pressure. The result: a dramatic decrease in filter replacement, saving the military time, money and decreased shipping and inventory of filters plus the added benefit of a greater range of deployment.